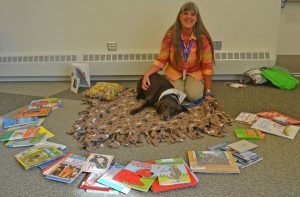 On a Saturday morning in September, Eden Prairie’s Cheryl Bann spread a brown fleece blanket and some books on the floor of the Hennepin County Library in Eden Prairie. Wilson, Bann’s 9-year-old Chesapeake Bay retriever mix, was sitting nearby. 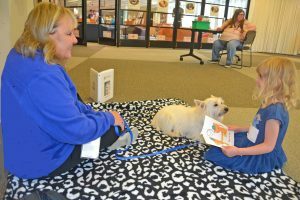 After everything was ready, Bann sat down and Wilson laid on the blanket to wait for visitors to the Paws to Read program. Chris and Mylene Morris of Golden Valley and their 14-month-old daughter, Breiah, were the first to meet Wilson and Bann that morning. Wilson laid contently on his side as Bann stroked his fur and the young family was all smiles while they thumbed through the pages of a dog book. When they finished with the book, Chris, Mylene and Breiah spent a few minutes petting Wilson before their allotted time was done. This is just one of many interactions Bann and Wilson have had at different facilities around the metro since they became a therapy animal team. Wilson is Bann’s first therapy dog. “Animals have the ability to touch people in many different ways. They are loving, nonjudgmental and make a unique connection with people. This just sounded like a pretty awesome way to help others, and I was curious to see how it would pan out so I decided to give it a try,” Bann said. According to the Minnesota Department of Human Rights, service animals are defined as individually trained dogs that work or perform tasks for people with disabilities that are directly related to that person’s disability. The Department of Justice has provided guidance that allows miniature horses of a specific size to serve as a service animal under the Americans with Disabilities Act and the state follows this guidance. These animals are considered working animals and not pets. “A dog whose sole function is to provide comfort or emotional support does not qualify as a service animal,” the department’s site states. 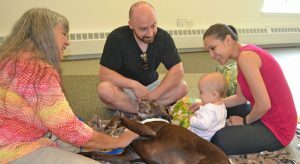 Therapy animals are invited to a variety of a facilities around the metro including the Minneapolis-St. Paul International Airport, college campuses, public libraries, schools and hospitals. 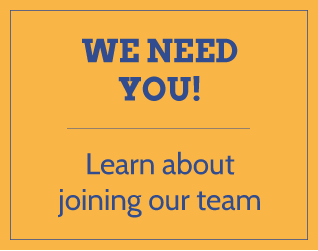 There are multiple groups and programs people can join to volunteer with their pet locally including the Pets Assisting With Healing volunteer pet therapy program with the Children’s Minnesota pediatric health system; Reading Education Assistance Dogs literacy program for schools and libraries, and North Star Therapy Animals, a local organization of therapy animal teams. In these programs, dogs are generally the most common therapy animal, but some have included other species such as cats, guinea pigs, rabbits and miniature horses. Some programs use teams that have been certified through the national Pet Partners program, according to their websites. Love on a Leash is another national program that provides therapy animal certification, though no chapters are in Minnesota, according to its website. Bann and Wilson are part of North Star Therapy Animals. Together they have visited Park Nicollet Methodist Hospital, the Minneapolis V.A. Hospital, a dementia care facility, a senior center, the international airport and have been part of programs and visits at the University of Minnesota and Normandale Community College in addition to Paws to Read at the Eden Prairie Library. “Each type of visit is unique in regard to the people who we interact with and their needs. I’ve been impressed to see Wilson shift his approach depending on the needs of the people. He’s definitely a pro,” Bann said. 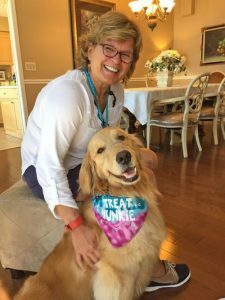 Holly Parker of Eden Prairie is a trained evaluator for Pet Partners, and she is a member of North Star Therapy Animals with her 4-year-old golden retriever, Bailey. She said the process to become a certified Pet Partners therapy animal handler can take three to six months depending on the animal. It includes taking a pet handler course, filling out an animal health screening form and going through a team evaluation. Pet Partners teams get insurance coverage for volunteer visits and can access a database of volunteer opportunities. “They’re looking for an animal that enjoys other people, being around other people, that seeks out interactions with others,” Parker said, adding the animal should show signs of being comfortable and happy in different situations. The Eden Prairie School District is one of the local entities that has seen the benefit of therapy animals. Sheryl Cater, a teacher at Eden Lake Elementary School, has offered reading time with her dog, Mac, as a silent auction item at the school’s carnival. Students then come in and read with Mac during a workshop day when other students aren’t in the building. She also brings Mac to read at a PTO-sponsored reading event at Barnes & Noble, said Jaclyn Swords, director of communications. 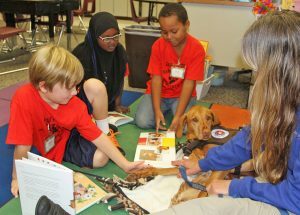 Cedar Ridge Elementary students read to a therapy dog. The school has had a program for over 10 years where students read to a therapy dog visiting the school. Katie Tompkins, a Cedar Ridge Elementary School second-grade teacher, said the school has had a literacy program with therapy dogs for over 10 years. The dogs and their handlers visit all four second-grade classrooms once a month for an hour at a time. During the sessions, one or two children will sit on a blanket with the therapy dog and its owner. Kids read dog-themed books for 15 minutes before another student gets a turn. The event is the highlight of the year for many of the second-graders. Parker said pet teams are allowed to volunteer a maximum of two hours per day. She visits different facilities about four to five times each week. She and Bailey first got certified two years ago. They have visited detox patients at the University of Minnesota, interacted with residents at Prairie Adult Care in Chanhassen and met college students at the U of M. Bailey is an animal ambassador at the international airport. Bann said Wilson is an animal ambassador at the airport. They recently sat with a young girl who had never flown before and was anxious. “She sat, talked and petted Wilson for quite a while and then had to go. I gave her one of Wilson’s ‘baseball cards’ to take with her on the flight and reminded her to look at it if she felt anxious. She left us with a big smile — and his card,” she said.